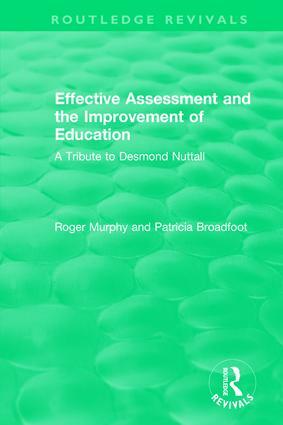 Originally published in 1995, this volume brings together twenty classic contributions from the work of Desmond Nuttall as an educational researcher, thinker and policy adviser. A full commentary by two of his former colleagues who knew him well accompanies the text. They have set out to explain and explore the essence of his contribution to others. Much in the book is as relevant today as when the articles were written; put together they form a formidable collection. The book was published in the year after Desmond’s death. It is hoped it will remain a fitting tribute to him. It will remind his friends of his classic ideas and brings together in one volume contributions that students of education may have missed. Nuttall, D.L. (1973) 'Convergent and divergent thinking' in Butcher, H.J. and Pont, H.B. (Eds) Educational Research in Britain, London, ULP. Nuttall, D.L. (1975) 'Examinations in education' in Cox, P.R., Miles, H.B. and Peel, J. (Eds) Equalities and Inequalities in Education, London, Academic Press. Nuttall, D.L. (1978) 'The case against examinations', Supplement to Education, 152, 2, pp. v-vi. Nuttall, D.L. (1979a) 'A rash attempt to measure standards', Supplement to Education, 154, 12, pp. ii-iii. Nuttall, D.L. (1979b) 'The myth of comparability', Journal of the National Association of Inspectors and Advisers, 11, pp. 16-18. Nuttall, D.L. (1980a) 'Will the APU rule the curriculum? ', Supplement to Education, 155, 21, pp. ix-x. Nuttall, D.L. (1980b) 'Did the secondary schools get a fair trial? ', Education, 155, 2, pp. 46-51. Nuttall, D.L. (1983) 'Unnatural selection? ', The Times Educational Supplement, 18 November. Nuttall, D.L. (1984) 'Doomsday or a new dawn? The prospects for a common system of examining at 16+' in Broadfoot, P. (ED) Selection, Certification and Control, Lewes, Falmer Press. Nuttall, D.L. and Goldstein, H. (1984) 'Profiles and graded tests: The technical issues' in Profiles in Action, London, Further Education Unit. Nuttall, D.L. (1986a) 'What can we learn from research on testing and appraisal?' in Dockrell, B. et al. (Eds) Appraising Appraisal (report of a conference organized by the British Educational Research Association at Sheffield, 11 March), Kendal, BERA. Nuttall, D.L. (1986b) 'Problems in the measurement of change' in Nuttall, D.L. (Ed) Assessing Educational Achievement, Lewes, Falmer Press. Goldstein, H. and Nuttall, D.L. (1986) 'Can graded assessments, records of achievement, modular assessment and the GCSE co-exist?' in Gipps, C.V. (Ed) The GCSE: An Uncommon Exam London, Institute of Education/Heinemann. Nuttall, D.L. (1987) 'The validity of assessments', European Journal of the Psychology of Education, II, 2, pp. 109-18. Nuttall, D.L., Goldstein, H., Presser, R. and Rasbash, H. (1988) 'Differential school effectiveness', International Journal of Educational Research, 13, 7, pp. 769–76. Nuttall, D.L. (1989c) 'National assessment: Complacency or misinterpretation?' in Lawton, D. (Ed) The Educational Reform Act: Choice and Control, London, Hodder and Stoughton. Nuttall, D.L. (1989a) 'National assessment — Will reality match aspirations? ', BPS Education Section Review, 13, 1/2, pp. 6-19. Nuttall, D.L. (1991) Assessment in England, Report prepared for Pelavin Associates. Nuttall, D.L. (1994) 'Choosing indicators' in Riley, K. and Nuttall, D.L. (Eds) Measuring Quality: Education Indicators United Kingdom and International Perspectives, London, Falmer Press. Nuttall, D.L. (1993b) 'Presentation at Centre for Policy Studies Conference, 21 September 1993'.